stalks, originally uploaded by jahansell. There's something about this photo I like - the corn all looks like it's waiting in a crowded starting line for a race, jostling for position, and as soon as the gun goes off they'll take off down the road! Or like they're being buffeted by a storm. Or maybe they are waving to passersby! What a beautiful photo. Just discovered your blog, it's fantastic. The old saying "knee high by the 4th of July..." seems to work here. Looks like old-fashioned roasting ears. I like field corn. Tough but delicious. 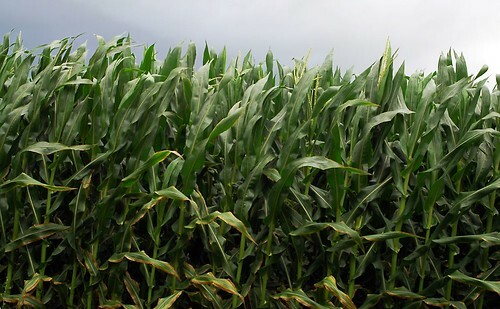 Looks a jungle!...I do love sweetcorn. When will it be ready for harvesting Jenny? I have an air show this weekend.